» What is a Concussion? A concussion is a disturbance in brain function that occurs after an impact to either the head or the body that causes violent shaking of the brain. Even a “ding,” “getting your bell rung ” or what seems to be a mild bump or blow to the head can be serious. You can’t see a concussion. Signs and symptoms of concussion can show up right after the injury or may not appear or be noticed until days or weeks after the injury. If your child reports any symptoms of concussion, or if you notice the symptoms yourself, seek medical attention right away. How can you help your child avoid a concussion or help if a concussion occurs? Ensure that they follow their coach’s rules for safety and the rules of the sport. Make sure they wear the right protective equipment for their activity (such as helmets, padding, shin guards, and eye and mouth guards). Protective equipment should fit properly, be well maintained, and be worn consistently and correctly. Learn the signs and symptoms of a concussion. Teach your children the signs and symptoms of a concussion. 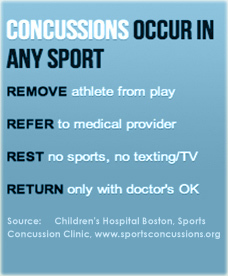 Instruct your children not to continue playing if they think they have any signs or symptoms of a concussion. What should you do if you think you child has a concussion? Keep your child out of play. Concussions take time to heal. Don’t let your child return to play until a health care professional says it’s 0K. Children who return to play too soon-while the brain is still healing-risk a greater chance of having a second concussion. Second or later concussions can be very serious. They can cause permanent brain damage, affecting your child for a lifetime. Call our office for evaluation. The center will see your child within 48-72 hours of their injury for evaluation and management. Tell your child’s coach about any recent concussion. Coaches should know if your child had a recent concussion in ANY sport. Your child’s coach may not know about a concussion your child received in another sport or activity unless you tell the coach. 203-914-1900 | ©2015 NEINH All rights reserved.